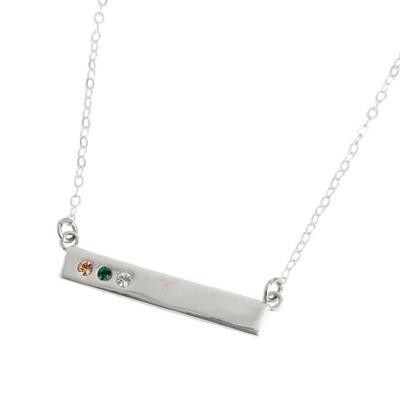 "Silver Bar Necklace with 3 Birthstones for Grandmothers, Engraved with Blessed"
Our Count Your Blessings necklace will be treasured for generations. Customize with 2, 3, 4, 5, 6, 7, or 8 birthstones of those you love. The word "blessed" is engraved on the back of the necklace for added meaning. The three stone bar is perfect for the mother of three children. Or pick the 5 stone design to represent the kids and both parents. How many blessings can you count? On this simple necklace you can count up to eight grandkids or all the members of your family! Each birthstone can represent someone you love. You can put just the birthstones of your kids or grandkids or you can include mom and dad too. For a grandmother of three you can put a birthstone for each child in the 3 stone design. Or, add the parent's birthstones and pick the 5 stone design. The listed price is for 3 stones. If you want more stones the price will increase. The necklace is available in 16" and 18". Made of sterling silver and the birthstones are Swarovski crystals. All sales are final.